Immersed as I have been in team names and school mascots over the past several weeks, I began to wonder how many colleges have prairie dogs as a mascot. Why wonder such a thing? Every time I visit daughter Meg and son-in-law Andrew in Denver, which I did just last month, I’m intrigued by the prairie dogs. They’re everywhere. Because I’ve never lived amongst the little critters, I find them fascinating. And adorable. Somewhat akin, I suppose, to how someone who lives in a place with no possums finds them fascinating and adorable. Prairie dogs aren’t dogs at all, of course. They’re ground rodents. The spot where I went to watch them is about two miles from Meg’s house and near a busy four-lane road. The vast, desolate patch of ground is officially named Willow Spring Open Space. But I call it Prairie Dog Park. Before you spot the prairie dogs, you hear them. Early explorers of the American West, including Lewis and Clark, likened the sound these little animals make to the bark of a dog. Thus the name. But I think it’s more like the sound of a bird or a frog chirping in a shrill, monotonous way. Prairie dogs rest upon their hind legs atop mounds of dirt that look like giant ant hills. When frightened, they retreat into holes that lead to sophisticated underground burrows, which are divided into nurseries, sleeping quarters and “toilet rooms.” No kidding. A family group known as a coterie lives in each burrow. The coterie usually includes an adult male, several females and their offspring. They share food, groom one another, and show affection by kissing or nuzzling. Several coteries located near each other are called neighborhoods, and several neighborhoods clustered together make up a prairie dog town. It all depends on who you talk to. Ask a farmer or rancher how he feels about prairie dogs and he’ll tell you they’re a pestilence. Their burrows have the potential to break the legs of livestock. Being vegetarians, prairie dogs damage crops. They’re prey for rattlesnakes. And prairie dogs are susceptible to fleas that carry bubonic plague. Who needs that? Environmentalists hum a different tune. They point out that black-tailed prairie dogs, the breed that lives in central Colorado and ten other states, were once the most abundant animal in North America. The estimated one billion prairie dogs that inhabited the West have now been reduced in number to ten or twenty million. How? Humans have moved into their space. And many of those humans are eager to eradicate prairie dogs by any means available, from bullets to traps to poison. A shame, because prairie dogs are a “keystone species”–an important source of food for predators, including badgers, foxes, falcons, eagles, owls and the endangered black-footed ferret—essential to the health of our planet. And they really are adorable. 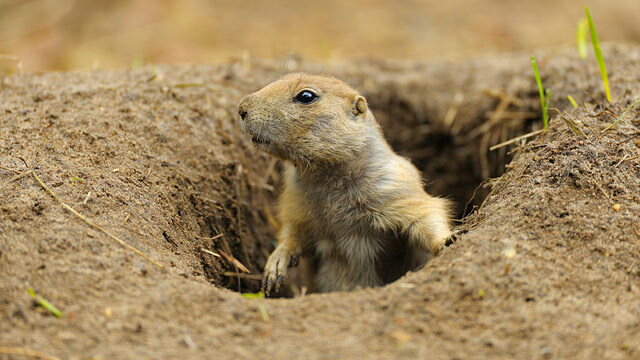 As I stood, stock-still, in Prairie Dog Park, they hesitantly began to emerge from their holes. First, I saw one. Then three. Then ten. Then dozens. All perched atop their mounds of earth, black tails twitching like metronomes. And here’s the really weird, really neat thing. Every one of those prairie dogs faced the spectacular view of the Rocky Mountains. I stood and watched for several minutes and then began slowly walking away. Of one accord, the prairie dogs scampered down into their burrows. And I began writing this column in my head. Now, as to which colleges sport the delightful prairie dog as mascot, I found only one. The now-defunct College of Santa Fe. Go figure.